Nathan Hale has created another fabulous graphic account of a series of important historic events. While I was familiar with parts of the story, there were other parts that I wasn't aware of and so I ended up learning a lot. It's always fun for me to learn things from books that are also highly entertaining. 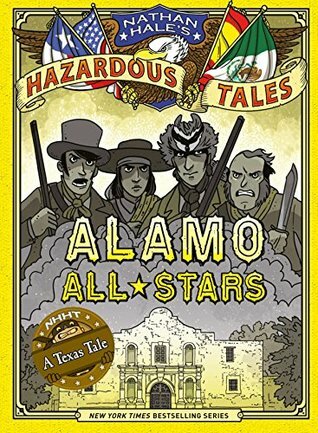 Not that the story of the Alamo is a particularly happy one, all the defenders died after all, and there remain many questions about what exactly happened (such as when and where Davy Crockett died). I appreciate the fact that Hale is careful to point out parts of the story that are speculation or based on stories of uncertain origin. This series is a fabulous way for young readers to catch a glimpse of important historical events and some of the people who lived through them. The sacrifices made by many involved create a rather interesting picture as do the tales of those fiery few who helped win the day. This could be part of an interesting discussion about uncertainty in a history class. Thanks for highlighting the title!